VOGONS • View topic - Duke Nukem Forever 2001, the version that did seem good, might be released!!!! Duke Nukem Forever 2001, the version that did seem good, might be released!!!! We loyal Duke Nukem fans have had to put up with a lot of disappointments, not just with Duke Nukem Forever, when it was *finally* released, being a game that couldn't even reach the dizzy heights of mediocrity, but also with the Duke Nukem 3D: 20th Anniversary World Tour adding so little of any value to the twenty year old classic. 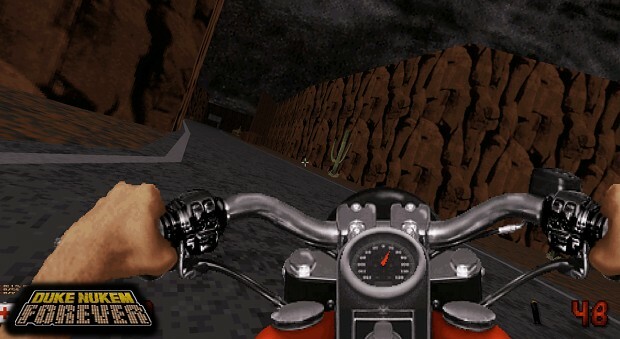 There was never a sequel to the fantastic N64-only Duke Nuke: Zero Hour, and we never got the fantastic looking fan-authored remaster of Duke Nukem 3D, Duke Nukem 3D:Reloaded (https://www.youtube.com/watch?v=6v78cee1rI8). This remaster originally received official permission to continue, but that permission was later withdrawn (which did NOT please Duke Nukem fans, to put it mildly) and the project seems to have been abandoned as a result. I don't think any official reason was ever given for the retraction of permission to work on the mod, but the common belief is that Gearbox were worried that the mod would make their upcoming Duke Nukem Forever look bad. This is the same Gearbox who later released the appallingly bad Aliens: Colonial Marines, a game so bugged and different from it's early preview videos, that some fans actually tried to sue Gearbox. 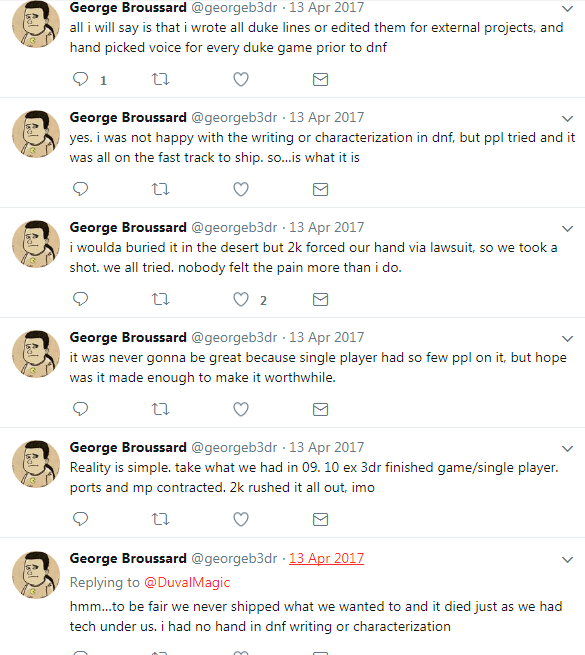 The same Gearbox who allegedly used money that was given to them by Sega to finance work on Aliens: Colonial Marines, but who instead, it's claimed, spent that money on their own (Gearbox's) Borderlands 2 game, thereby explaining partly or mostly why A:CM turned out so bad (markedly worse even than Duke Nukem Forever). The same Gearbox that is run by Randy Pitchford, who, in an industry where most of the big names aren't known to the public, is disliked enough for people to remember him and post negatively whenever he's mentioned. ">-This is the famous "2001" version. -You basically had Mission Objectives on your HUD you could activate - Like quests. You also had an inventory with ID badges, keycards, etc. Things you would use in the world. Think Deus Ex Duke. -You meet and save NPCs. Solve puzzles, and try and solve the mystery of what's going on. -Then you meet the infected EDF who's attacking you. And the story evolves from there. -Oh.. there's also a subway in vegas you can take to visit different districts in the city. -It's super fun in multiplayer. 12 maps are pretty much done. - "One of the first levels in the game, when you visit your own office. You see the hands on the keyboard, and can write an email from your own computer in-game. The game crashes as soon as you press "Send" as it tries to connect to an old POP3 server which doesn't exist anymore"
In the fan communities people generally refer to Gearbox Softwares Duke Nukem as "Douche Nukem" and dislike the shift from an 80s/90s action homage under 3D Realms to what now draws comparisons to Family Guy. I really hope that this will one day (soon!) be released. Yes, it might well never be released. And even if it is, then the "90% done" estimate might prove to be closer to 30% done. Or if it is really 90% done, then it might turn that the missing 10% is the code and data that actually makes the whole thing work, and even if everything does work, the game might still turn out to be rubbish. And Duke Nukem as an RPG/first person shooter with a darker plot and unsettling events might turn out to be very bad in themselves (it's not what we were expecting, given DN3D's satirical science-fiction action-hero setting complete with humour and parodies of popular culture). But maybe we will get it, maybe it will be made fully playable by Frederik Schreiber (possibly assisted by DN fans and modders), and maybe, just maybe, it will turn out to be the Duke Nukem Forever that we always wanted to have. Re: Duke Nukem Forever 2001, the version that did seem good, might be released!!!! And let's not forget - Gearbox still holds the IP. I would LOVE to play this version, on period-correct hardware of course. Please let this be true, I've always wanted to try out the original duke nukem forever (or at least one of). I've been meaning to try the fan-made mod Duke Nukem Forever 2013, for Duke Nukem 3D, for a long time, as by all accounts it's really good, and does a good job of building upon what was promised and shown in the early (good!) videos and screenshots.